We at the Springfield Chapter of the ILSSAR recognize the accomplishments and the service of our local first responders and service men and women in the armed forces. Every month we give a spotlight to two of these heroes. If you have a first responder or service member you would like to see highlighted in this segment please inform us on out Contact Us page. 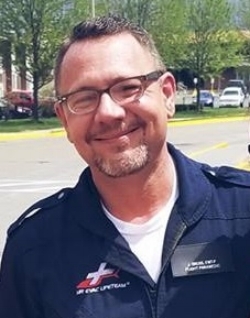 Jason is a flight EMT with Air Evac Lifeteam based out of Jacksonville, IL. Jason was recognized in the State Journal-Registar May 29th, 2018 for his role is assisting a woman who had broken her leg at a venue where the show Jason was directing 1776: the Musical was being performed. Jason has spent most of his working life as an EMT for various companies in Springfield and the Alton area. We thank you Jason for your service. The link to the newspaper article can be located here. Bobby is very involved not only in the defense of our nation but also in local theater. When not on deployment, Bobby can be found at the Springfield's Muni Opera or the Hoogland Center for the Performing Arts. Bobby is currently stationed in South Carolina.